Building a design in 3D, either physically or digitally, forces you to resolve all the details that were not evident in your 2D drawings and sketches. The model becomes a tool for understanding—a process, not simply a product. Building a design in 3D, either physically or digitally, forces you to resolve all the details that were not evident in your 2D drawings and sketches. The model becomes a tool for understanding—a process, not simply a product. We use this process in our workflow to test designs, explore new modelling/fabrication technologies and, frankly, to have fun. Even in miniature, the models build our technical knowledge and strengthen our dedication to craft. Below are some of the finished products. 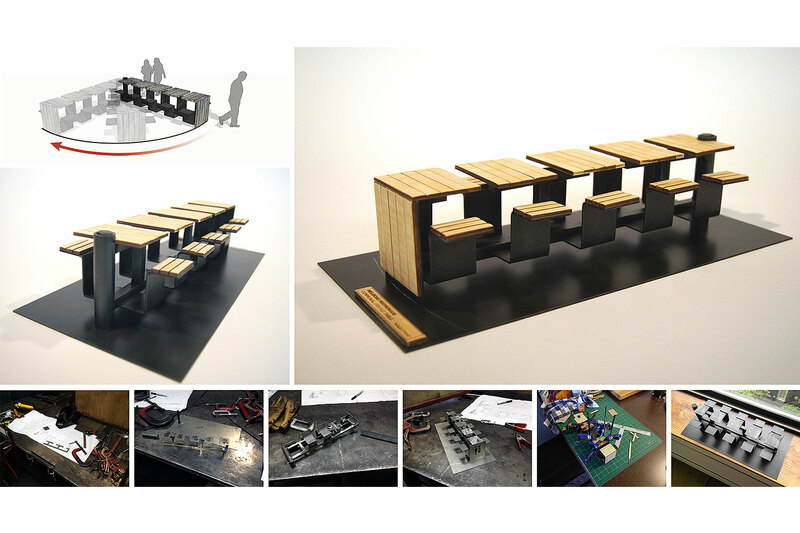 Melrose Promenade Communal Table: Digital modelling was completed in SketchUp. The program is great for extruding standard shapes and building assemblies. Once the massing and connections were worked out in the model, 2D drawings were exported and refined in AutoCAD. 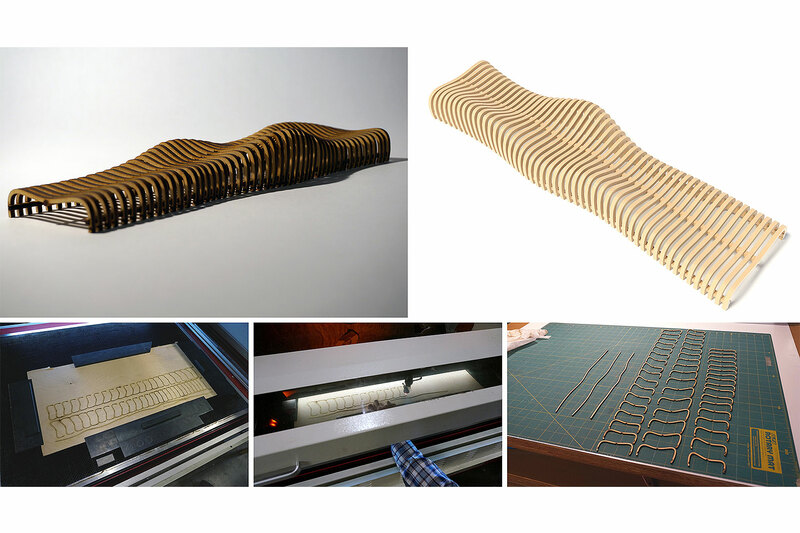 The dwg files for the wood components were fed directly to a laser cutter while 2D drawings of the metal components were used as reference in a more traditional fabrication process (cutting, folding, welding and finishing). Model: Laser cut 1/8” birch plywood. 3/8” bar and 16 ga. mild steel with blackened finish. Digital modelling in SketchUp. Fabrication files from SketchUp and AutoCAD. Olympic Range Bench: This seating element evokes the Olympic Mountain range. The form is not too complex but we wanted the ability to manipulate the peaks and valleys throughout the modelling process and automate, to the extent possible, the generation of the individual wood members. This was achieved using Rhino with the parametric plugin Grasshopper. Models were then exported as stl files for printing on a MakerBot 3D printer. Model: 3D Printed (MakerBot). 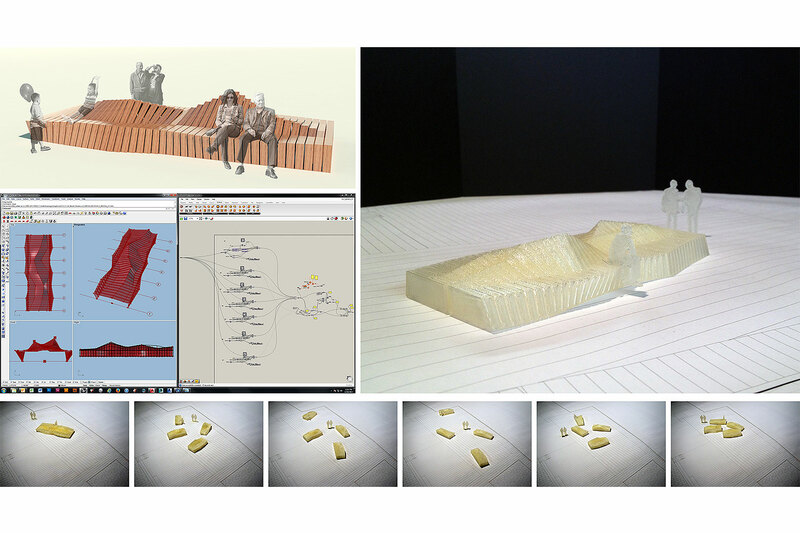 Digital modelling in Rhino with Grasshopper. Rendering with 3D Studio Max and Photoshop. Wave Bench: Located in the center of a public space, the wave bench is approachable from all sides to provide a range of seating or lounging positions. 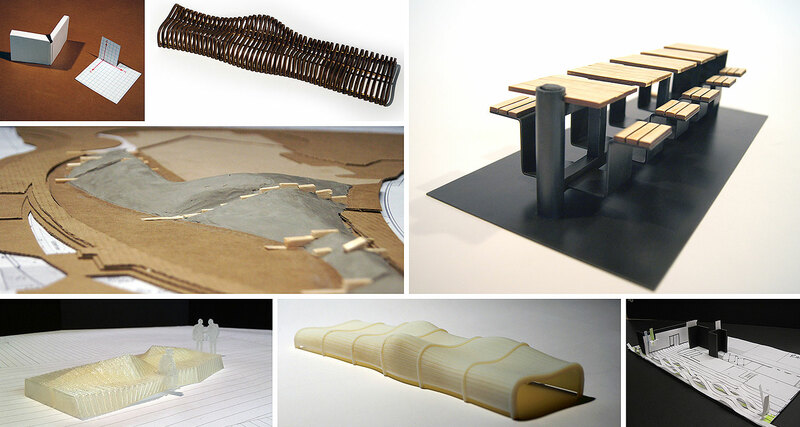 The basic form of the bench was built as a parametrically controlled surface in Rhino with Grasshopper. Once the contours of the form were set, Grasshopper was used to ‘slice’ the surface to generate the individual sections and lay them out for laser cutting. Each section was numbered to aid in final assembly. Model: Laser cut 1/8” birch plywood. Digital modelling in Rhino with Grasshopper. Rendering with 3D Studio Max.